Priced: $62.99 - $99.00 Rated: - 4 stars out of 5 by 15 reviews. When black clouds descend from above the canyon, reach into your backpack for The North Face Women's Venture Jacket. The waterproof, breathable HyVent 2.5-layer membrane and fully taped seams easily shed water and keep you bone-dry while you make your way back to camp. Constructed with 100% recycled nylon ripstop fabric, the Venture gives you eco-friendly vibes while you endure pelting rain or sleet. Underarm vents ditch excess heat, a fully adjustable hood with hidden drawcord system shields your head and face from the elements, and the brushed chin-guard lining offers comfort when you zip all the way up. The Venture's adjustable hook-and-loop cuffs, hem cinch-cord, and center-front zip and hook-and-loop closure seal out wet weather so you stay dry even during heavy rain cycles. Two zippered hand pockets stash your lip balm, cell, or energy goo, and the entire jacket stows in one of the hand pockets when the sun comes out. 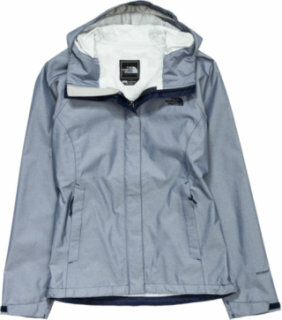 FEATURES of The North Face Women's Venture Jacket. SPECIFICATIONS of The North Face Women's Venture Jacket. The North Face Venture Jacket for Women is made to outlast severe rainstorms, featuring a fully adjustable hood with visor and drawcord, pit-zips, center front zip and Velcro storm flap and a hem cinch-cord. This durable jacket is engineered with an eco-friendly HyVent membrane and a waterproof, breathable outer layer to protect you from rain year round. The eco-friendly Venture Jacket reduces the use of synthetic membrane components by 50% compared to traditional waterproof materials. Available in every color of the rainbow, you'll never be short of wardrobe matches with the North Face's Venture Jacket. All the jacket features you'd expect, without extras to weigh you down. Little details make this jacket truly lovable, like the brushed chin guard for softness against your face, and adjustability everywhere. Pit-zip vents allow you to dump heat during exertion without opening up to the elements. The perfect, lightweight weather protection for heading to school or off into the hills. Be warned, to try it is to love it. Whether you're hiking with friends or exploring the urban jungle alone, make the The North Face Venture Jacket your buddy on your next adventure. HyVent® 2.5L waterproofing sheds raindrops like a duck's back and pit-zip vents let you dump heat when the pace quickens. For weather protection that's reliable as the sun rising in the morning, keep the Venture Jacket by your side. The North Face Venture Jacket is the jacket that every outdoor enthusiast needs. Some athletes just need a jacket that's waterproof, breathable, and engineered to withstand severe wilderness storms. A year-round classic for wilderness storms and everyday use, The North Face Venture Jacket provides waterproof, windproof protection and breathable comfort with HyVent technology. Fiber Content: 100% nylon ripstop. Engineered to withstand severe rainstorms and styled for everyday use. This lightweight, waterproof jacket is a staple for every outdoor enthusiast. Featuring an attached, fully adjustable hood with visor, pit-zips, and a hem cinch-cord, you'll stay dry hour after wet hour with this durable rain jacket. Engineered with HyVent® DT EC, a new material derived from natural castor oil from beans, this eco-friendly jacket reduces the use of synthetic membrane components by 50% compared to traditional waterproof materials. HyVent DT: This waterproof fabric is lightweight, packable, and more breathable than other unlined treated fabrics. HyVent DT is created by applying a polyurethane (PU) coating with a DT print matrix which acts as a dry-touch, half-layer coating. The DT half layer adds durability and comfort by physically separating the HyVent DT PU coating from the skin. HyVent DT eliminates the need for a liner and is commonly referred to as a 2.5-layer fabric. 9 people have already set their own price. I'm in love with this jacket! I wear it over my other ones to protect them from rain and to keep me dry. I'll also wear it by itself when it gets warmer. It's just so cool and stylish and wonderful in every way. I love this jacket from the color to the fit! I've gotten so many compliments. It works well in the rain and still keeps you cool. The only problem is the velcro gets caught on stuff because it's not hidden. The jacket is nice but they are too expensive. I would recommend to a friend but I would also warn them how expensive these products are. Love this North Face jacket! Just right for the overcast days of the Northwest. True to size! Pure white! Comfy love North Face! EXCELLENT! Wonderful for all types of weather. Absolutely waterproof and so far has proven to be quite stain resistant as well. Great jacket but wrong size. I need to print return receipt label and mail back for one size bigger. Love, love, love this jacket! Comfy, lightweight, easy to clean. Would recommend to anyone! Rally lightweight! Great material, fits well! Great jacket...until a few years pass and the polyurethane coating inside begins to disintegrate. I bought this jacket six years ago for the summer rainy season in Puerto Vallarta and it was great for a season or two. Now it is an embarrassment with the tiny specks of white from the coating flying around like dandruff sticking to my skin and clothing. I would not get this unless I was assured that this problem with the polyurethane coating was fixed. not what I expected and for the price it was a bummer to receive. especially since it was for my mom. To be very honest...I like the color of the jacket but thats about it. It wasnt what I expected it to be. It is VERY light. It has absolutely no lining and I thought it would. Its a very cute jacket but a lot lighter than I expected for an $100 jacket.